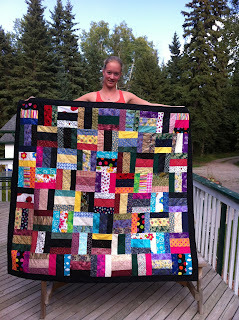 Magpie Quilts: Quilting, the Next Generation! Wondeful!! Congratulations to your neice on her first fabulous finish!! Do you think she is hooked yet? She has some very creative people in her family, so I'm sure she'll keep up some kind of creativeness. Whether it's quilting or something else, only time will tell! Wow, that is so great that she is making quilts! Good for her. It looks amazing.